The Beginners Grow Set Review. 20 White Widow autoflowering seeds, one of the easiest, but most popular Cannabis strains. 3 Plant Protector formula's designed to defend your plant against pests, moulds and fungus attacks. Complete 20 plant fertiliser pack containing all the elements, nutrients and micro-nutrients needed for each stage of your plants development. 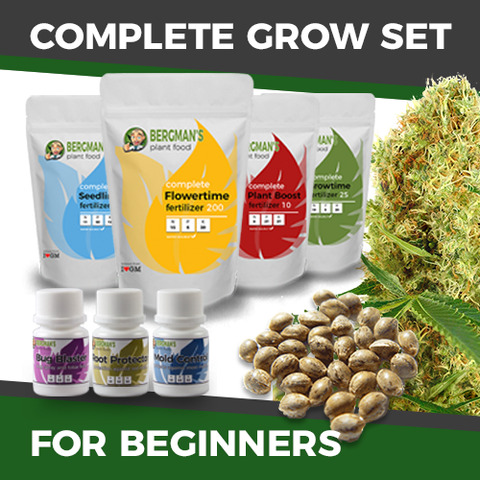 Find out more about The Complete Beginners Grow Set. White Widow produces a sociable, talkative, relaxed feeling that makes it a great smoke to enjoy with friends. Perfect for day and night use with a strong, pain-relieving 'body-buzz' and happy, euphoric high. Too much, too fast, can produce 'couch-lock' in light smokers. A very well-known form of Cannabis, White Widow autoflowering is true to it's heritage, displaying all the traits and attributes associated with this world-famous strain. Large, dark green leaves, dense, swollen buds and a thick coating of resin that sparkles, creates the 'white' effect these seeds are known for. Perfect for both indoor and outdoor growing, easy and needing very little experience to produce a high quality crop of potent Cannabis. A well-known and popular choice of medicinal Cannabis, favoured for it's pain relieving properties and ability to reduce stress and anxiety, easing depression. Can have a positive effect on insomniac's, assisting relaxation and sleep. Read the complete White Widow Autoflowering Seeds review. Buy The Complete Beginners Grow Set today and receive free worldwide shipping guaranteed.